Colonel T W McLeay, 79th New York State Militia, resigned due to bilious fever on 29 April, 1861, and J Cameron was mustered in United States service as colonel, 79th New York State Militia, on 6 June, 1861. Colonel J Cameron, 79th New York State Militia, was killed at the first battle of Bull Run on 21 July, 1861. Lieutenant Colonel S McK. Elliot was mustered in United States service as lieutenant colonel, 79th New York State Militia, on 1 June, 1861, and was discharged on 10 August, 1861. Major D McClellan was mustered in United States service as major, 79th New York State Militia, on 1 June, 1861, and was discharged on 10 August, 1861. The company was accepted in state service at New York City, New York County, New York, on 13 May, 1861, and W Manson was mustered in United States service as captain, 79th New York State Militia, Company A, on 28 May, 1861. The company was accepted in state service at New York City, New York County, New York, on 13 May, 1861, and J A Farrish was mustered in United States service as captain, 79th New York State Militia, Company B, on 27 May, 1861. The company was accepted in state service at New York City, New York County, New York, on 13 May, 1861, and T Barclay was mustered in United States service as captain, 79th New York State Militia, Company C, on 27 May, 1861. Captain T Barclay, 79th New York State Militia, Company C, was discharged on 12 August, 1861. The company was accepted in state service at New York City, New York County, New York, on 13 May, 1861, and D Brown was mustered in United States service as captain, 79th New York State Militia, Company D, on 27 May, 1861. Captain D Brown, 79th New York State Militia, Company D, was killed at the first battle of Bull Run on 21 July, 1861. The company was accepted in state service at New York City, New York County, New York, on 18 May, 1861, and D Morrison was mustered in United States service as captain, 79th New York State Militia, Company E, on 27 May, 1861. Captain D Morrison, 79th New York State Militia, Company E, was mustered in United States service as major, 79th New York State Militia, on 21 October, 1861. The company was accepted in state service at New York City, New York County, New York, on 13 May, 1861, and J Christie was mustered in United States service as captain, 79th New York State Militia, Company F, on 27 May, 1861. Captain J Christie, 79th New York State Militia, Company F, was discharged on 10 September, 1861. The company was accepted in state service at New York City, New York County, New York, on 18 May, 1861, and J Laing was appointed captain, 79th New York State Militia, Company G, on 21 April, 1862, dated 28 May, 1861. The company was mustered in United States service at Manhattan (New York County), New York City, New York, on 28 May, 1861. The company was accepted in state service at New York City, New York County, New York, on 13 May, 1861, and J E Coulter was appointed captain, 79th New York State Militia, Company H, on 18 May, 1861. The company was mustered in United States service at Manhattan (New York County), New York City, New York, on 27 May, 1861, and Captain J E Coulter, 79th New York State Militia, Company H, resigned on 1 November, 1861, dated 31st October, 1861. The company was accepted in state service at New York City, New York County, New York, on 18 May, 1861, and R T Shillinglaw was appointed captain, 79th New York State Militia, Company I, on 25 October, 1862, dated 27 May, 1861. The company was mustered in United States service at Manhattan (New York County), New York City, New York, on 27 May, 1861. The company was accepted in state service at New York City, New York County, New York, on 1 June, 1861, and H A Ellis was mustered in United States service as captain, 79th New York State Militia, Company K, on 28 May, 1861. Captain H A Ellis, 79th New York State Militia, Company K, was discharged on 2 December, 1861, dated 30 November, 1861. 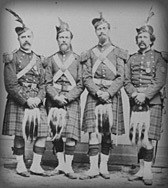 The First City Band was accepted in state service with seventeen musicians, under the command of First Lieutenant T W Robertson, 79th New York State Militia, Company E, on 13 May, 1861, and was mustered out on 18 August, 1862. The drum corps was accepted in state service with twenty drummers on 13 May, 1861. "The New York, Seventy-ninth Regiment (Highlanders) arrived here about two o'clock this morning. They number eight hundred men, exclusive of their band and drum corps, the former consisting of sixteen performers, and the latter of twenty drummers. About a third of the members wear the full Highland uniform, the remaining being dressed in blue jackets trimmed with red, dark green plaid pants, and blue fatigue cap." "Among the recruits for the various regiments here, which will probably arrive this morning, are forty recruits for the second New York regiment, now encamped at Ball's Crossroads, and forty recruits for the Highlanders. A detachment of sappers and miners, and a large body of recruits for the Garibaldi Guard, who have all been recruited in New York city, within the past week, are also expected today. One hundred men, one hundred and twenty horses, and a number of ambulances, for the second Maine regiment, now stationed over the river, will also arrive today." Him on the one side and me on the other: The Civil War letters of Alexander Campbell, 79th New York Infantry Regiment and James Campbell, 1st South Carolina Battalion, edited by Terry A Johnston, Jr. The 79th New York State Militia was not order into active service under the call for 75,000 volunteer militia to serve three months on 15 April, 1861, and was ordered to Washington, D. C., under the call for 42,034 volunteers to serve three years, unless sooner discharged, on 2 June, 1861, dated 3 May, 1861. Accepted in state service, New York City, New York County, New York, 13 May-1 June, 1861: The 79th New York State Militia, Companies A, B, C, D, F, and H, were accepted in state service at New York City, New York County, New York, on 13 May, 1861; Companies E, G, and I, on 18 May, 1861; and Company on 1 June, 1861. Mustered for three years, New York City, New York County, New York, 27 & 28 May, 1861: The 79th New York State Militia, Companies B, C, D, E, F, H, and I, were mustered in United States service for three years at New York City, New York County, New York, by Captain M Cogswell, 8th United States Infantry, Company E, on 27 May, 1861; and Companies A, G, and K by Captain S B Hayman, 7th United States Infantry, Company C, on 28 May, 1861. The 79th New York State Militia was stationed at Palace Garden, on West Fourteenth Street, between Sixth and Seventh Avenues, New York City, New York County, New York, on 2 June, 1861. Palace Garden, on West Fourteenth Street, between Sixth & Seventh Avenues, New York City, New York County, New York, to Washington, D. C., 2-4 June, 1861: The 79th New York State Militia (900), under the command of Lieutenant Colonel S M Elliott, was ordered to proceed by steamer John P Jackson on the North or Hudson River at Jersey City Ferry Terminal, on Courtlandt Sreet, New York City, New York County, New York, to Jersey City, Hudson County, New Jersey, at 5 PM on 2 June, 1861, and proceeded by the New Jersey Railroad to Washington, D. C., at 11 PM the same day. The regiment arrived at Newark, Essex County, New Jersey, at 12 AM on 3 June, 1861, and was ordered to Trenton, Mercer County, New Jersey, in the morning the same day. The 79th New York State Militia arrived by the Camden Branch, Camden & Amboy Railroad, at Camden, Camden County, New Jersey, on 3 June, 1861, and was ordered by ferry across the Delaware River to Philadelphia, Pennsylvania, at 7 AM the same day. The regiment was ordered to proceed by the Philadelphia, Wilmington & Baltimore Railroad to Baltimore City, Maryland, at 11 AM on 3 June, 1861, and arrived the same day. The 79th New York State Militia was ordered to proceed by the Baltimore & Ohio Railroad to Washington, D. C., at 12 AM on 4 June, 1861, and arrived by the Washington Branch, Baltimore & Ohio Railroad, via Annapolis Junction, Howard County, Maryland, at 2 AM the same day. Note: The 79th New York State Militia was ordered to Washington, D. C., by Special Orders No.6, Headquarters, Fourtn Brigade, New York City, New York County, New York, on 29 May, 1861, and rendezvoused at Palace Garden, on West Fourteenth Street, between Sixth and Seventh Avenues, New York City, New York County, New York, at 2 PM on 2 June, 1861. Washington to the grounds of Georgetown College, on Warren Street, Georgetown, D. C., 4 June, 1861: The 79th New York State Militia arrived at the grounds of Georgetown College, on Warren Street, Georgetown, D. C., in the morning on 4 June, 1861. Note: J Cameron was appointed colonel, 79th New York State Militia, in the afternoon on 21 June, 1861. Grounds of Georgetown College, on Warren Street, to heights one mile north of Georgetown, D. C., 2 July, 1861: The 79th New York State Militia arrived at Camp Lochiel, on the heights one mile north of Georgetown, D. C., on 2 July, 1861. The 79th New York State Militia was stationed at Camp Lochiel, on the heights one mile north of Georgetown, D. C., between 2 and 7 July, 1861. Camp Lochiel, on the heights one mile north of Georgetown, D. C., to Ball's Crossroads, Alexandria County, Virginia, 7 July, 1861: The 79th New York State Militia was ordered across the Potomac River at the Aqueduct Bridge, Georgetown, D. C., in the afternoon on 7 July, 1861, and arrived at Camp Weed, one mile east of Ball's Crossroads, Alexandria County, Virginia, the same day. General Orders No.13, Headquarters, Department of Northeastern Virginia, Arlington, Alexandria County, Virginia, 8 July, 1861: The 79th New State Militia was assigned to the Third Brigade, First Division, McDowell's Army, under the command of Colonel W T Sherman, 13th United States Infantry, by General Orders No.13, Headquarters, Department of Northeastern Virginia, Arlington, Alexandria County, Virginia, on 8 July, 1861. Note: A detachment of the 79th New State Militia (150) arrived by the Washington Branch, Baltimore & Ohio Railroad, at Washington, D. C., in the evening on 9 July, 1861, and a detachment, under the command of Paymaster A V Elliott, 79th New State Militia, was ordered to Washington, D. C., at 6 PM on 12 July, 1861. Advance to Centreville, Fairfax County, Virginia, 16-18 July, 1861: The 79th New York State Militia was ordered to proceed by the Leesburg & Alexandria Turnpike Vienna, Fairfax County, Virginia, at 2 PM on 16 July, 1861, and arrived via Falls Church and Old Courthouse, Fairfax County, Virginia, at 8 PM the same day. The regiment was ordered to Germantown, Fairfax County, Virginia, at 5.30 AM on 17 July, 1861, and arrived via Flint Hill, Fairfax County, Virginia, at 1 PM the same day. The 79th New York State Militia was ordered to Centreville, Fairfax County, Virginia, in the afternoon on 17 July, 1861, and arrived three miles west of Germantown, Fairfax County, Virginia, in the evening the same day. The regiment was ordered to Centreville, Fairfax County, Virginia, at 7 AM on 18 July, 1861, and arrived north of the Warrenton Turnpike, one and half miles west of Centreville, Fairfax County, Virginia, in the morning the same day. Note: Brigadier General I McDowell, United States Army, arrived at Germantown, Fairfax County, Virginia, at 1.30 PM on 17 July, 1861. Blackburn's Ford, on the Bull Run River, 18 July, 1861: The 79th New State Militia was stationed on the road between Blackburn's Ford, on the Bull Run River, and Centreville, Fairfax County, Virginia, as a reserve during the skirmish at Blackburn's Ford, on the Bull Run River, at 4 PM on 18 July, 1861, and was ordered north of the Warrenton Turnpike, one and half miles west of Centreville, Fairfax County, Virginia, in the afternoon the same day. Note: The 79th New York State Militia was stationed north of the Warrenton Turnpike, one and half miles west of Centreville, Fairfax County, Virginia, in the evening on 18 July, 1861. North of the Warrenton Turnpike, one & half miles west of Centreville, Fairfax County, Virginia, to the Stone Bridge on the Bull Run River, 21 July, 1861: The 79th New York State Militia was ordered to proceed by the Warrenton Turnpike to the Stone Bridge, on the Bull Run River, at 2.30 AM on 21 July, 1861, and arrived north of the Warrenton Turnpike, three quarters of a mile east of the Stone Bridge, on the Bull Run River, between 5 and 6 AM the same day. Retreat to Washington D. C., 21-22 July, 1861: The 79th New York State Militia was ordered to Centreville, Fairfax County, Virginia, at 4 PM on 21 July, 1861, and to Fairfax Courthouse, Fairfax County, Virginia, at 12 AM on 22 July, 1861. The regiment arrived at Camp Weed, one mile east of Ball's Crossroads, Alexandria County, via Vienna, Fairfax County, Virginia, at 12 PM the same day. Note: Colonel W T Sherman, 13th United States Infantry, arrived in the vicinity of Fort Corcoran, a quarter of a mile southwest of Ross' House, on Arlington Heights, Alexandria County, Virginia, at 12 PM on 22 July, 1861, and was stationed at Fort Corcoran, a quarter of a mile southwest of Ross' House, on Arlington Heights, Alexandria County, Virginia, on 25 July, 1861. A detachment of the 79th New York State Militia arrived at the west side of the Long Bridge, Washington, D. C., and at Arlington Heights, Alexandria County, Virginia, on 22 July, 1861. South of Fort Corcoran, a quarter of a mile southwest of Ross' House, on Arlington Heights, Alexandria County, 23 July, 1861: The 79th New State Militia was ordered south of Fort Corcoran, a quarter of a mile southwest of Ross' House, on Arlington Heights, Alexandria County, on 23 July, 1861, and was accompanied by the 2nd Wisconsin Infantry (See the 2nd Wisconsin Infantry). Fort Corcoran, a quarter of a mile southwest of Ross' House, on Arlington Heights, Alexandria County, Virginia, to Massachusetts Avenue, between Sixth & Seventh Street, Washington, D. C., 24 July, 1861: The 79th New York State Militia was ordered across the Potomac River at the Aqueduct Bridge, Georgetown, D. C., to Massachusetts Avenue, between Sixth and Seventh Streest, Washington, D. C., on 24 July, 1861. Massachusetts Avenue, between Sixth & Seventh Streets, to L B Haw's, on Meridian Hill, at the junction of Tenth & Boundary Streets, Washington, D. C., 26 July, 1861: The 79th New York state Militia, under the command of Acting Colonel & Lieutenant Colonel S M Elliot, was ordered to L B Haw's, on Meridian Hill, at the junction of Tenth and Boundary Streets, Washington, D. C., on 26 July, 1861. Note: The 79th New York State Militia was stationed at Camp Ewen, L B Haw's, on Meridian Hill, at the junction of Tenth and Boundary Streets, D. C., on 5 August, 1861. Redesignated 79th New York Infantry, 7 December, 1861: The 79th New York State Militia was redesignated the 79th New York Infantry on 7 December, 1861. Mustered out, Alexandria, Alexandria County, Virginia, 14 July, 1865: The men of the 79th New York Infantry not entitled to be mustered out were consolidated as the 79th New York Infantry, Companies A and B, on 13 May, 1864, and the three years' men of the 79th New York Infantry, under the command of Lieutenant Colonel J More, were mustered out at New York City, New York County, New York, on 31 May, 1864. Companies C (2nd) and D (2nd) were assigned to the 79th New York Infantry on (?0 November, 1864; Company E (2nd) on (?) January, 1865; and Company F (2nd) on (?) March, 1865. The 79th New York Infantry, Companies A, B, C, D, E, and F, under the command of Lieutenant Colonel H G Heffron, was mustered out at Alexandria, Alexandria County, Virginia, on 14 July, 1865. Colonel W T Sherman, 13th United States Infantry, Third Brigade, First Division, McDowell's Army: W T Sherman proceeded to St Louis, St. Louis County, Missouri, on 27 March, 1861, and was appointed colonel, 13th United States Infantry, by General Orders No.33, Adjutant General's Office, Washington, D. C., on 18 June, 1861, dated 14 May, 1861. Colonel W T Sherman, 13th United States Infantry, was assigned to inspection duty at Washington, D. C., between 20 and 29 June, 1861, and was assigned to command the Third Brigade, First Division, McDowell's Army, by Special Orders No.16, Headquarters, Department of Northeastern Virginia, Arlington, Alexandria County, Virginia, on 30 June, 1861. He was appointed brigadier general, United States Volunteers, by General Orders No.62, Adjutant General's Office, Washington, D. C., on 22 August, 1861, dated 17 May, 1861. Note: The 79th New York State Militia was assigned to Colonel D E Sickles's provisional brigade, Division of the Potomac, by Special Orders No.11, Paragrpah I, Headquarters, Division of the Potomac, Washington, D. C., on 5 August, 1861 (See Volunteers, Department of Washington).